Add POF for Sun, Weather, and Graffiti Protection--$21.95! The is the Big Daddy - a 30x30 version our best selling Security Notice Property Protected By Video Surveillance Trespassers Will Be Prosecuted Sign made with Engineer Grade Reflective sheeting on heavy-gauge aluminum. 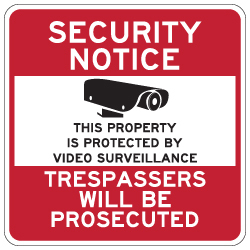 This popular Property Protected By Video Surveillance Sign is also available in 12x18, 18x24, and 24x24 sizes. Orders of 10 or more signs take 15 work days to ship.